Mana is the Executive Director of Iranian Alliances Across Borders (IAAB), a 501(c)3 national nonprofit organization that aims to strengthen the Iranian diaspora community and empower its youth. IAAB has been featured on CNN and CNN International, The Washington Post, Huffington Post and PBS Frontline's Tehran Bureau. IAAB strengthens the Iranian diaspora community through leadership and educational programming that encourages collaboration and solidarity across various borders and multiple communities. IAAB addresses issues of the Iranian diaspora by facilitating community building, developing ways to better understand what it means to be part of a diaspora community, and empowering members of the Iranian diaspora community to enhance connections with their new communities as well as maintain connections with their root community. Under Mana's leadership, IAAB has grown into the largest grassroots organization dedicated to advancing the Iranian diaspora community through community-building and youth empowerment. IAAB responds to community challenges through various programs and campaigns while also empowering local communities to support their most vulnerable members. IAAB leads youth leadership camps, community conferences and university programs bringing together experts and student leaders from vibrant communities around the world including Europe, the Middle East and North America. IAAB also holds the only convening of Persian school directors and educators from the United States and Canada, with more than 30 participating schools. IAAB and Camp Ayandeh, its groundbreaking high school leadership camp, were also featured in The Limits of Whiteness; Iranian Americans and the Everyday Politics of Race, an insightful work about shifting racial status in the United States. IAAB is also the lead organizational plaintiff in IAABvTrump, a legal challenge that won against Muslim Ban 3.0 in the Fourth Circuit in February, 2018, and succeeded in obtaining in October, 2017. Mana has served on committees for many community initiatives including as steering committee member of the Iranians Count 2010 Census Coalition (ICCC), the Iran Earthquake Coalition, and as a Language Representative with the Coalition of Community-Based Heritage Language Schools. Mana﻿ was a Field Organizer at Amnesty International USA (AIUSA), Amnesty International's biggest section and part of its global movement of more than seven million people fighting injustice and promoting human rights. 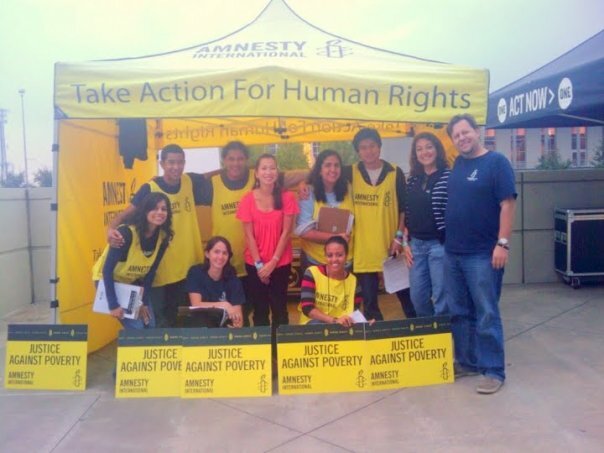 Amnesty International is the largest grassroots international human rights organization investigating and exposing abuses, educating and and mobilizing the public, and helping transform societies to create a safer, more just world. Amnesty International received the Nobel Peace Prize in 1977 for its "campaign against torture" and the United Nations Prize in the Field of Human Rights in 1978. Mana campaigned and organized in Alabama, North Carolina, South Carolina and Tennessee, as well as various other critical areas in the South. Mana focused on Amnesty International USA's campaigns to end the death penalty, maternal mortality, torture and indefinite detention, and harsh and restrictive anti-immigration policies. Mana also supported AIUSA's campaigns supporting human rights defenders and prisoners of conscience. Much of Mana's work while at AIUSA focused on ending domestic human rights violations. The South is the hotbed for most domestic human rights violations, including 80% of all US executions. As such, the South is integral to movement-building and domestic human rights campaigns. Mana was recognized as a ‘Progressive Women’s Voice’ of the Women’s Media Center and a 2018 Ford Public Voices Fellow with The OpEd Project. Mana was also featured as a changemaker in education by Neda Nobari Foundation’s ‘West of Middle East’ podcast series. Mana is an inspiring speaker and seasoned educator with over 15 years of experience in social movement work. Mana has given dozens of dynamic speeches at rallies, conferences, universities, and companies to audiences of all ages. Weaving together first-hand experiences and case studies through a historical lens, Mana provides practical advice in engaging workshops, talks, and panels at institutions throughout the United States and internationally. “All we want is the right to exist, the right to share the most important moments of our lives with our loved ones, and to no longer feel like we’re pawns in some political agenda. We are tired.” (Maryland federal court - October 17, 2017).